The team at Admiral talk us through what makes the company – one of Wales’ major contact centre employers, with offices in Cardiff, Swansea and Newport – so rewarding to work for. At Admiral we believe happy staff are more productive and people who enjoy what they do do it better. We offer great opportunities for promotion and personal development and everyone who works for us owns a part of the company with a free share scheme worth £3,600 a year. Many of our employees have followed a steady career path through Admiral gaining experience and additional qualifications along the way with 99% of our team managers having worked their way up from entry level. Admiral runs flexible working hours with free gym membership, eye tests, and private health insurance and train and bus season ticket loans. We also provide training, a fun working environment and incentives and rewards for a job well done. Admiral is a rapidly growing customer-focused insurance business working across seven countries providing our staff with the chance to make their mark and rise through the business. Rhys Pearce has enjoyed almost 20 years of working with Admiral in roles across all three of its key locations in Newport, Swansea and Cardiff. Rhys (pictured above) started his career with the company in tele-claims. 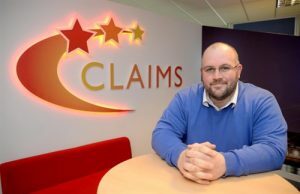 Next year the 38-year-old Claims Services Operations Manager will be taking his children and family on holiday to Disneyland in Florida thanks to the financial support he has received from Admiral’s share scheme. “The big thing for me is it’s given me so much variety in my career. “What Admiral has given me is challenges and variety along the way and it’s surprising how many different avenues your career can go in”. It’s a very enjoyable working experience and if you enjoy what you do you will do a far better job. I’m a firm believer that if you take care of people and those people look at claims in the eyes of the customer then you will get far greater results, the customer is centric to everything we do. It’s all about having great conversations with our customers. Staff at Admiral also find their additional income provided by £3,600 worth of free shares every year has, in some cases, allowed them to realise lifelong dreams. 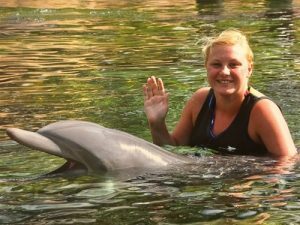 Bodily Injury Claims Handler Charlotte Matthews (pictured below) joined Admiral six years ago and used dividends earned on her shares to pay for her to swim with dolphins while on holiday in America. “I’ve always loved dolphins and sponsored one through the WWF when I was younger. “When I was in America I thought it would be amazing to do but as it was expensive I didn’t want to take such a big chunk out of my spending money. Customer care representative Lisa Chapman used her shares to help pay for a deposit on a house. “I’ve been lucky enough to have free shares and senior shares… I then fell pregnant with my son, and decided to step down as senior and go part time. 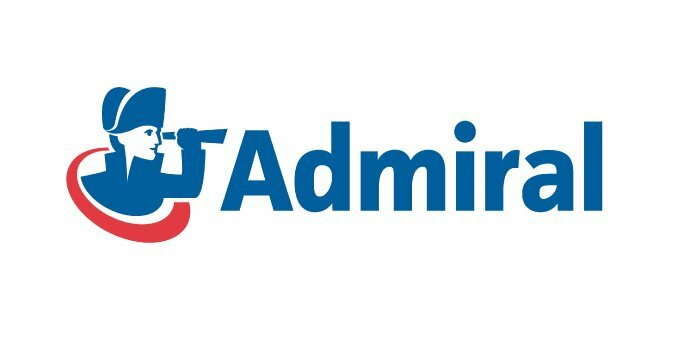 If you’d like to join the team at Admiral, please visit the buzzwales jobs board for the latest vacancies. Find out more about working for Admiral at the ‘Inside Admiral‘ blog.